I won’t speculate about the fate of Malaysia Airlines flight MH370, which disappeared on March 8. For the sake of the families I hope there is a resolution soon. What I do know is that MH370 will re-write the book on air traffic control, tracking airplanes and possibly piloting airplanes. Aviation as we know it, typically 2 pilots, physically inside an airplane, using mostly voice communications to an air traffic controller, will be history one day. MH370 will likely make that demise come sooner rather than later. Outside looking in, it must be baffling to the general public that a large airliner can just disappear off the face of the planet, especially in today’s wired world where we can reach just about anybody anytime at the touch of a touchscreen. In reality, airplanes over oceans and in remote areas can easily disappear because there is no continuous, real-time tracking in most remote or oceanic areas (the North Atlantic being the exception). There is no civilian radar beyond a couple hundred miles off shore so air traffic controllers rely on periodic position reports, either by voice communication or satellite data link. Position reports are made at pre-determined points such as every 10 degrees of longitude, every hour, or at specified navigation fixes. If a plane for some reason deviates or changes course, nobody on the ground would know until the pilots or the airplane’s data link reported the new course. Many sophisticated military surveillance systems exist around the world but those are looking for threats, not tracking any and every civilian airplane. There are many systems to make sure pilots and controllers can stay in touch at all times: VHF and HF radio, SELCAL, data links, radar, and various emergency systems. However, in today’s aircraft most of these systems depend to some extent on the pilot’s interaction with them. Certain accidents in the history of aviation were a catalyst for industry-wide changes: the crash of ValuJet 592 led the FAA to overhaul how it certifies new airlines, Air Florida flight 90 led to more stringent de-icing procedures and a new emphasis on CRM (cockpit resource management). More recently the crash of Colgan Air 3407 compelled the FAA to change experience and certification requirements for airline pilots. I’m sure the Malasia Airlines MH370 tragedy will have a similar if not greater impact on aviation. MH370 will greatly accelerate the implementation of real-time satellite data links, implementation of communication and navigation systems that are independent of pilot action, and possibly in the future remotely piloted aircraft. If you look at the military use of drones, airline pilots could soon be sitting in a secure ground location, “flying” their airplanes through remote data entry and monitoring – with automation or supervisors overriding any problematic inputs. Autopilots have long been able to do the physical work anyway. I imagine most of us would be reluctant to fly in the back of a remotely-controlled airliner, those pilots in their sharp uniforms smiling at the gate always gave us that confidence, that they would be there if all else failed. Now we may not be so sure. If MH370 in the end proves that the pilots can be compromised, may willfully cause a tragedy, or can be overtaken even in the post 9-11 era, pilots may soon go the way of telegraph operators – replaced by technology. I know the counter-argument would be that technology can be compromised as well. If a datalink to a remotely controlled airliner was compromised we’d have the same problem. However, that has never happened yet. On the other hand hijackings have happened and pilot suicides are largely believed to have caused the crash of EgyptAir flight 990 and SilkAir flight 185. If there is a knee-jerk reaction we only make it by looking back, not looking forward. None of this are new ideas. I submit that the greatest obstacle has not been cost or technological challenge but rather a psychological reluctance on our part. A reluctance that may be about to change. 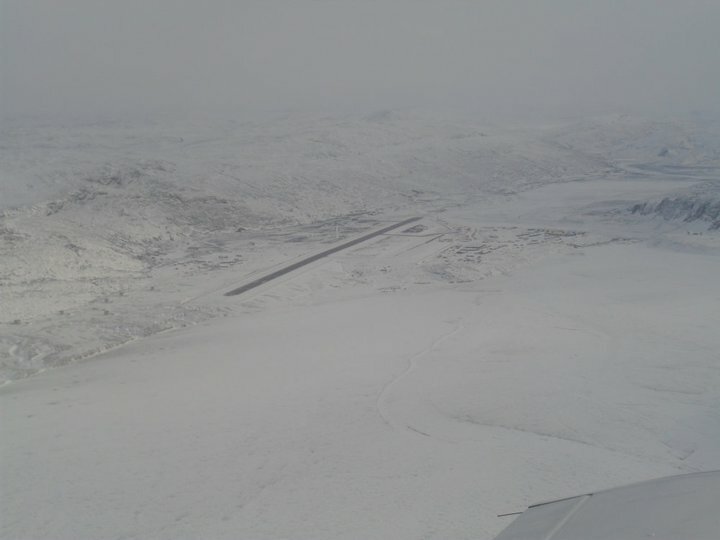 Just a pretty picture of Kangerlussuaq or Sondre Stromfjord airport – BGSF. I’m sure you’re going to be the first one to buy that ticket on the remote controlled 747 since pilots can be easily compromised right? Thanks for the comment, “real pilot”. I’m not saying I like the idea but I think in our lifetime we’ll see some type of “competent authority” on the ground that has ultimate control over airliners. I’d be surprised if we don’t see the traditional “Captain’s authority” slowly becoming vested in some ground based agency with at least some ability to remotely control the airplane.